While everybody blogs about Chinese New Year food, I will blog about Western food. I took a day off from work last Monday together with hubby so that we could go for a nice outing (without the boys *chuckle*). We went to a very nice old place, in Jalan Bukit Bintang - The Ship, yay! 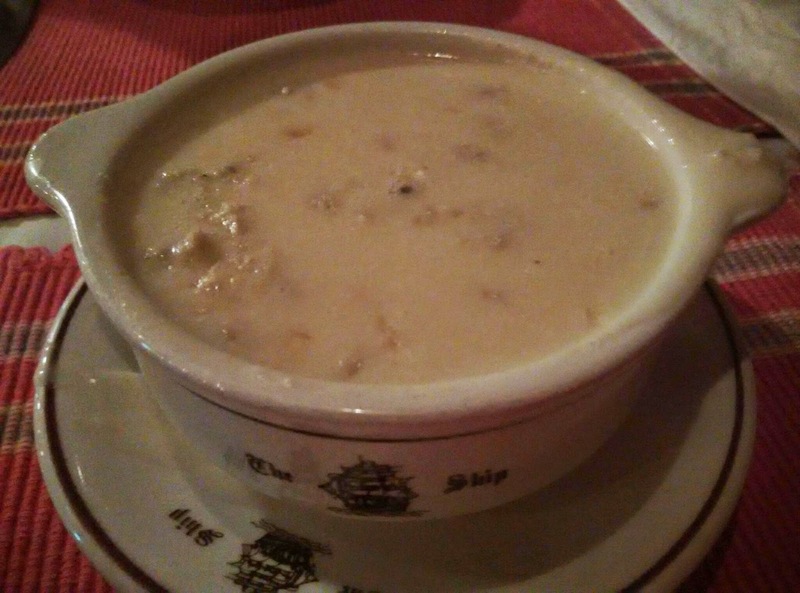 I had the seafood chowder. Hubby had the creamy crab meat and corn soup. I also tried their creamed spinach. Delicious! For my main course, I ordered the seafood au-gratin. 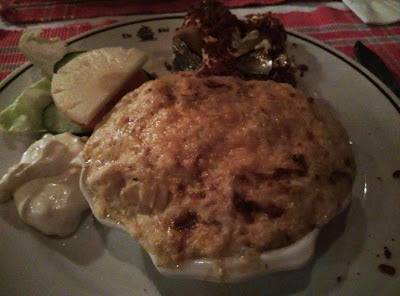 It has oysters, scallops, fish, squid and prawns inside, covered with bechamel sauce, topped with baked cheese. Ooooh la la, delicious to the max! Hubby ordered the ribeye steak. We had an enjoyable lunch, and I did a lot of walking and shopping too at Sg. Wang - an old place, full of memories for many I guess. I always stayed at Bukit Bintang and I always wanted to drop by The Ship...but I never got round to doing that. Did go to the fun pub upstairs a few times though - those days when I could still drink. I hear the food is very good...but the place is too dark to take nice pictures. Oh yes, the place is very dark.. Been like this since day1, dark place, but there's a pub upstairs.. Food is good, old school, old waitresses, old place, but everything is nice there - the soup, main course, even the banana split, hehe..
wah, so happy ah?? both took leave together, ditched the kids and go paktor chang toi geok woh.. The Ship!! yes of course I know this place but then too bad la, I have actually not been there before though I always wanted to try.. this restaurant was very "bah bai" among our parents' generation one leh, you know?? I think they still like to go there for gatherings and what nots geh..
the food must taste superb though I think they are still too old school to have those wowable presebtation like many contemporary (and overpriced) restaurant out there.. so it's like a very "frank" meal, you won't see flamboyant presentation but what you see is probably what you taste, good thing huh?? the seafood chowder if not mistaken is one of their famous dishes leh, and can see lots of liu inside woh.. the seafood au gratin and steak also looks good to me.. but then hor, are you sure those were what you ordered ah?? cannot be lah, Princess Ribbon ABC woh, eat so little only meh?? sure there were more you ordered to wallop one.. especially that you walked so much for the day, sure hungry and can eat a whole cow gak!!! come come come, show us all what you ordered!!! Haha, won't kena hentam and boycott la, memang ma, we are speaking the truth, same food everywhere - pak cham gai, yee sang, steamed fish, braised meat with sea cucumber, pineapple tarts, so leh, it's good to have some steamboat or western food now, hor? Mil used to have steamboat for reunion dinner for the past 2 years, but the rest "sik dou geng" (eat until scared) jor.. CNY eve tak habis the "liew", so they gotta eat the "liew" for the next 4-5 days !! Cook maggi mee or whatever, dump a few pieces of "liew" inside, so they scared jor loooo, no more steamboat..
Oh yes, tu kei happy geh, we sent the boys to the daycare, and we went out for some shopping in Time Sq first, but most of the shops tak bukak leh, like mm yau jou like that, so we went to have lunch first, then back to Sg. Wang (coz we need to get to Sg. Wang to cross over to The Ship), wah, all shops open jor in Sg. Wang, very "yit lau", so I did some shopping lor, bought some dresses and shoes..
Food is nice, like you said, old school.. Their fish & chips, chicken maryland and banana split ice cream still taste very nice, haha.. But of course I don't order fish & chips and chicken chop la, ngam mou? Eh, these was the only food we ordered la, coz I still munch this that in Sg. Wang and Time Sq.. I munched Famous Amos in Sg. Wang, then when we were back to Time Sq (coz we park our car there), I munched on some hotdog bread from Aunty Anne.. hahahahaha.. Fei sei ngor loooooo..
you can eat like a hippo and yet look like "ngan tiu gwai meng" all the time!! aiyoh, you are making all women and also men (especially me!!!) so jealous lor, because even we breathe also can get fat!!! They just opened a brand new one at the corner of Jaya33. I want to try that one as I believe it would not stink like the one at Uptown. Your Cream Spinach really attracted my attention to go and eat there this week! I have many friends who have kids now, and all of them are like you, they look forward to having the occasional paktor time without the kids in tow. Might look lousy to some, dark place and location not very strategic, coz we cannot cross over from BB Plaza to The Ship already.. Have to walk one big round from an entrance in BB Plaza (they would close down soon), turn one big round to Lot 10, cross the traffic light (I think two traffic lights), walk half a round, then only sampai The Ship..
Waah! Pengsan lah, RM170++ meals! My ship will sink la. The Ship...used to be my 'go to' steak place. Serves up some good old classic western dishes! Louiz, that was a nice outing! For once lah just two of you without the kids to kacau hee..hee... I like The Ship and have been to the one in Bukit Bintang only once. I usually go to the one in Damansara Utama but not that often. My favourite is either the steak or the chicken maryland. The one your ordered not ngam for me because it is too cheesy. Oh yes, the sauce is very very milky, creamy and cheesy, it's actually very "nau", but I like it, coz it makes me full after that.. The creamed spinach really taste like cream, nice !! Wah! Pak toh time with hubby! Nice. I love the food you ordered. Ooh la la is the right word for the seafood au gratin. I will sure pop after eating all those creamy dishes. Lol. Gain 1kg plus after this meal, but now gone back to original weight after skipping dinner for a few days..
Everytime I look back at my seafood gratin I get hungry too, and wana go back there to eat again..
someone go 'pak-thor' with hubby....on a Monday...hmmnn...such a nice way to start the week! Yeah while everyone still in their cny holiday, I've started work, but took one day leave, but worth it la..
Yeah, one day without the kids ok la, can get some quiet time..
Wah, got go Pak Tor with hubby to eat very delicious food! This is belated Valentine's Day meal, right? Can you believe it - I have not been to any of The Ship's outlet! Hahaha, so katak bawah tempurung lah me. Your food is very tasty! I sure like cheesy and creamy food but I think I will be full after I drink the soup so no use lah me. 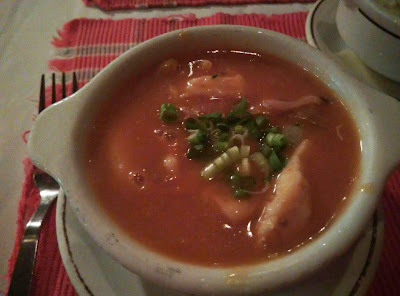 The soup is very hoi wai one, you can order the seafood chowder, coz it's a bit sour and spicy one, wont feel full..
Kong Hei Fatt Choy to you and your family! May all of you enjoy good health, wealth and happiness and have a Goooooaaatttt Year! Same to you, gong hei fatt choy to you & family, very fast la time flies, today chor8 liao..
Yeah I love that place so much, shopping and all.. Sg. Wang, Time Sq, all I like..
Not very CNY??? No leh. I see that you have change your profile picture into a pretty picture of you with a very CNY red outfit. I think you are not the only one who blog about non-CNY food... I saw Phong Hong ate non-Chinese food recently too. Whether Chinese food or not, I guess being happy feasting is the main purpose of dining out... Everything that you had in the Ship looks yum! Yeah not all talks about Chinese food la, it's good to see and eat some pasta and roast chicken after having so much steamed white chicken, yee sang, braised chicken feet with fatt choi, hehe.. Ooo yes, I love that au gratin dish, the cheesier the better, haha..
Its been a while I been to the ship. Love their steak ! Yeah, once a while, take a break and wind down. 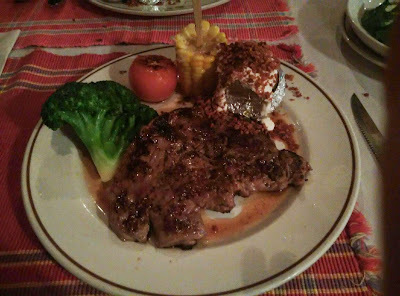 Yep, hubby likes their steak.. Ribeye and sirloin sedap.. But I still prefer my au-gratin, hehe..
anyways.. i did not manage to snap any CNY food.. hence no CNY food post.. hahaha..
CNY is just another ordinary day to me.. After getting married, not excited about CNY anymore..
Food look indeed good, Ribbon. Yep good food, delicious! Would love to go there again..
Hi Princess Ribbon, my first visit. I remember The Ship. Been there while working in KL...30 over yrs ago...Happy CNY to you. You look real cute with your ribbon. My dad is a huge fan of The Ship so we've always dined there at different stages of our growing up (we still do to this day!). 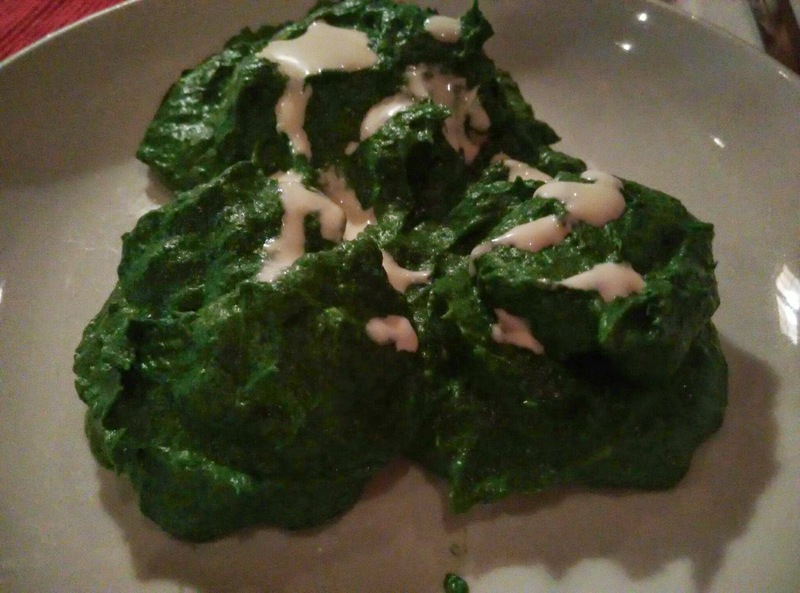 I've never tried the creamed spinach, though. Super tempted!! Sedap !! You must go try, but the texture is like cream, a bit sandy (coz spinach has a lot of sand nomatter how thorough you washed it).. It's been a long time since I've been to The Ship, there's another outlet near where I used to stay in Damansara Heights. Yeah, I heard of the one in Damansara.. But dunno same taste or not with the one in Bukit Bintang..